Amber and Jasmine, 2018 oil on linen, 59 1/4 x 55 1/8 x 1 1/2 inches. Courtesy of the artist and Jack Shainman Gallery. The absolute elegance and grace of Lynette Yiadom-Boakye’s work is breathtaking. In her latest exhibition of oil-on-linen paintings at Jack Shainman’s two galleries in Chelsea, Yiadom-Boakye shares the intimacy of private spaces, and quiet seeming moments, with the viewer as heavy, gestural brushstrokes narrate scenes of solitude and reflection. The characters in her works take center-stage with close-ups and full-body renderings that absorb much of the composition. Her larger-than-life characters appear in candid, almost vulnerable moments, constructed of visible brushstrokes in stunning brown hues and colorful underpaintings that peek through to the surface, highlighting Yiadom-Boakye’s masterful use of color. While the influence of her writing career is not directly reflected in her artwork, each painting tells its own story, pieced together through the expressive body language of its main character(s), and the conspicuous props that are often delicately placed within the painting, piquing the viewer’s curiosity. At the very core of this series, the multi-talented Yiadom-Boakye creates a safe space for Black bodies to inhabit; void of popular culture’s otherness context or requiring substantial explanation. The intimacy of solitude, reflection and even recreation that is presented in her work paints a picture of profound existence. She takes common, ordinary scenes of Black life and amplifies the weight of such moments, both physically and conceptually, almost in opposition to the societal or archetypal need to explain who they are or what they are doing. With a stripped away aesthetic, the beauty of Yiadom-Boakye’s paintings provides a sense of existential respite for the interpretation of the Black body. Through poignant displays of leisure and the tonal richness of her lush scenes, her subjects are simply free from the societal shackles imposed on POC. The visual poetry of Yiadom-Boakye’s canvases is not only timely and necessary, but it affirms the Black body within the white, male, cis, dominated canon of fine art. 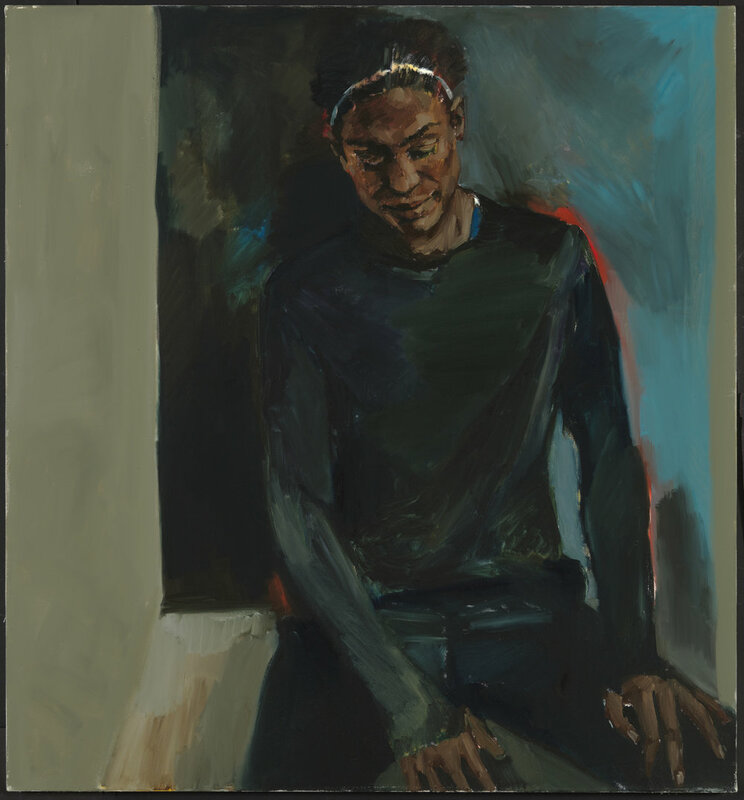 Lynette Yiadom-Boakye’s In Lieu of a Louder Love will be on view at Jack Shainmain’s two Chelsea locations through February 16, 2019. Level with the Lawn, 2018 oil on canvas, 55 1/4 x 51 1/4 x 1 1/2 inches. Courtesy of the artist and Jack Shainman Gallery. 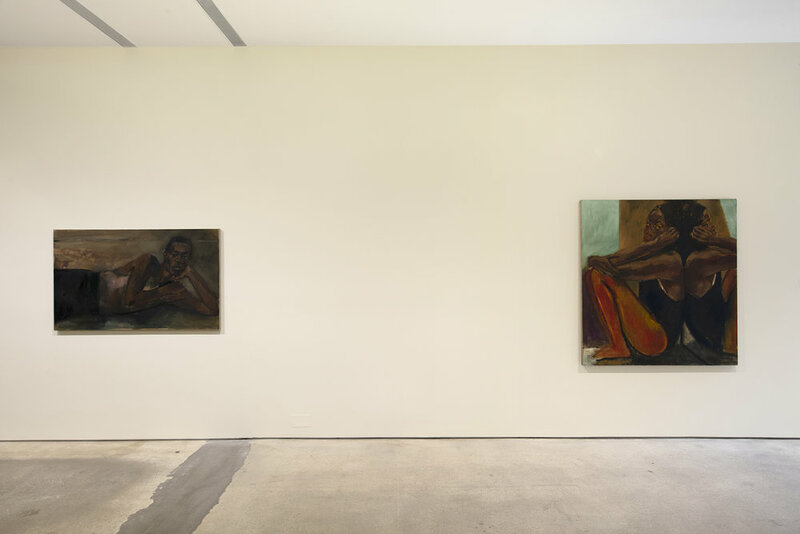 Installation view of Lynette Yiadom-Boakye’s In Lieu of a Louder Love. Courtesy of the artist and Jack Shainman Gallery.